I have long said that my favorite aspect of my books is the characters. When I am in writing mode, I awaken in the morning wondering what new and fun thing these people will bring to my life that day. In Penance, which takes place in our near future, the thrill comes solely from the antics of fictional characters. But in Precipice and Pentecost, some of the fun came from the ability to put the fictional characters into the sphere of influence of historical figures. One of the most interesting historical figures is Archbishop Paul Marcinkus, a Chicago native who rose to power in the Vatican and even headed the Vatican Bank from 1971 to 1989. He is mentioned briefly in the novel, Precipice, as one of the people with whom my nefarious character Benny had to coordinate activities. Benny and all his antics are fiction, but the actions and characters that surround Marcinkus are nearly as scary and immoral as anything Benny could pull off. Marcinkus had some incredibly bad playmates. One of them was Roberto Calvi. He was an Italian banker, whose bank, Banco Ambrosiano, had the Mafia as its major investor. He used his connections with the Marcinkus to launder dirty Mafia proceeds by funneling them through the Vatican Bank to a Swiss Bank that was co-owned by the Vatican and Calvi. In return, Marcinkus and the Vatican received higher-than-market rates of interest and a vehicle to surreptitiously channel funds for political purposes, such as the funding of Poland’s Solidarity movement, which eventually broke the back of Soviet reign in that nation. Calvi and Marcinkus had a good friend by the name of Michele Sindona, an aggressive Sicilian banker with the nickname, The Shark. The Shark’s pump and dump schemes on the Italian stock market with Calvi may have been the inspiration behind Marcinkus’s purchase of bogus securities from the American mob to use as collateral in obtaining legitimate financing. (A pump and dump scheme occurs when someone bids up the price of a worthless stock for a period of time. When the market gets interested and wants to buy the shares, the original investor dumps the stock to them at the artificially high price.) Sindona also was helpful in relieving the Vatican of a wealth of investments in various companies (pharmaceutical, water, and a variety of other businesses) when the Vatican wanted to liquidate some of its vast holdings. Although Marcinkus is living out his retirement playing golf in Arizona, things did not go so well for his friends when their financial skullduggery came to light. Sindona went on to buy Long Island’s Franklin National Bank. Franklin National went under, leading to a chain-reaction failure of all of Sindona’s business affairs. Sindona wasn’t happy with the failures and summarily ordered a hit on Giorgio Ambrosoli, the lawyer commissioned with the task of liquidating Sindona’s holdings. At the same time, Palermo’s police superintendent, Boris Giuliano was murdered while investigating allegations Sindona’s involvement in the Mob’s heroin trafficking. In the end, Sindona was convicted of Ambrosoli’s murder, but mysteriously died of cyanide poisoning while in prison. Calvi didn’t fare any better. As the investigations turned to his banks, he escaped Italy and made his way to a small flat in London, where he hid while trying to find a white knight banker to bail him out. Upon his departure from Italy, his secretary dove to her death from his fifth story office window. Funding never came for Calvi, but someone did. He was discovered hanging by the neck from the Blackfriars Bridge in London’s financial district. His clothing was stuffed with bricks. The location and manner of death lead some to believe his murder was at the hands of an illegal Italian masonic lodge known as P2 because they are masonic (i.e., the bricks) and refer to themselves as frati neri, or “black friars”. These guys all factor prominently in David Yallop’s investigative book, In God’s Name. Yallop pretty convincingly shows that a financially astute new pope, John Paul I, quickly caught on to their shenanigans. As you’ll recall, Pope John Paul I mysteriously died after only 33 days in office, leading Yallop to the conclusion that he was murdered. Given the fates of others involved with Marcinkus, you have to at least consider the possibility. 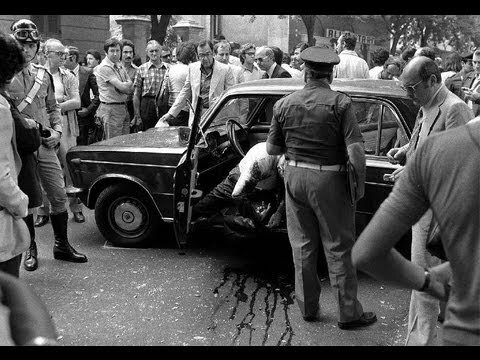 In a haunting footnote, in July 1976, an Italian magistrate named Vittorio Occorsio was investigating the P2 connection to Calvi’s activities and death. He was killed by machine gun blasts while exiting his car in a public square. It is his photo at the top of this post. His death is the basis for an execution witnessed by the character Chris in Precipice. To be honest, I would worry about myself if all the vile occurrences in my novels came only from my own imagination, but as it is I worry about the world, because the background for events in the lives of my characters are far worse than the fiction they inspire.